The New Zealander of the Year Awards office is pleased to provide the following nominations update for the 2018 New Zealander of the Year Awards. 984 nominations have been received for 2018 Kiwibank New Zealander of the Year. New Zealander of the Year Awards manager Glyn Taylor has noted the surge in nominations for New Zealanders working to solve major social issues such as poverty, mental health and the environment. "As the country weighs up which political party will best make New Zealand a better place, this year's nominations show we have many fine citizens already tackling major issues such as poverty, mental health, vulnerable children, healthcare, the environment and social justice. "These people are the true agents of change. They inspire and give us real hope that New Zealand can be the fair and equitable country we want it to be. Their selflessness, perseverance and relentless positivity gives is what makes us all proud to call them our own." 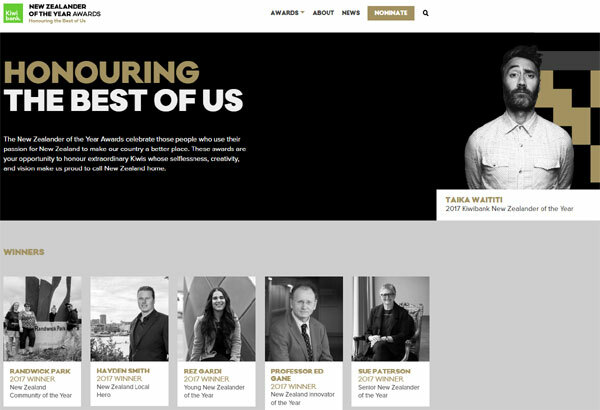 The annual New Zealander of the Year Awards are in their ninth year. They recognise, encourage and reward New Zealand's most vital asset – its people. They're open to all New Zealanders and celebrate the contributions of New Zealanders from all walks of life. The 2018 Kiwibank New Zealander of the Year will be announced at the New Zealander of the Year Gala Awards in Auckland on 22 February 2018. Previous winners of the New Zealander of the Year Award are: Taika Waititi (2017), Richie McCaw (2016), Sir Stephen Tindall (2015), Dr Lance O'Sullivan (2014), Dame Anne Salmond (2013), Sir Richard Taylor (2012), Sir Paul Callaghan (2011) and Sir Ray Avery (2010).